Manchester City weren’t too pleased at Wednesday night’s trip to Everton being scheduled between big games against London giants Arsenal and Chelsea, but it’s that time of the season when being in four competitions means there is no respite. 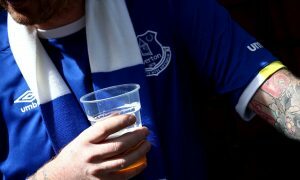 The Blues impressively swept aside Arsenal on Sunday and will hope to continue that form on Merseyside against an Everton team that has been under-performing of late under Marco Silva and would love a big scalp at Goodison. A number of City players put in big shifts at the weekend and with Chelsea coming up, we can expect some changes made by Pep. He noticeably didn’t make any substitutes until 80 minutes or later against Arsenal, suggesting a number of those on the bench against Arsenal could start on Wednesday. The news was good from Pep Guardiola’s Tuesday press conference, with the boss saying all outfield players except Vincent Kompany and Eliaquim Mangala are fit. That means Benjamin Mendy could play some part after he suffered swelling to a knee following his return from a serious injury. Claudio Bravo was named in the Champions League squad and is stepping up his recovery, but is still a way off returning. Ederson showed no signs of the leg injury that had City worried when up against Arsenal, and will be between the sticks again. At the back, we can probably expect a few changes, including to the formation itself with Pep likely to revert to City’s usual system. Kyle Walker was good against Arsenal and should retain his place at right-back, with Danilo returning on the left if we assume Mendy won’t start yet – and it seems unlikely following his latest setback. There’s a case for Delph, but we’ve seen precious little of the 29-year-old since his red card against Leicester on Boxing Day. John Stones was benched at the weekend and can expect to line up against his former club. Partnering him we think will be Aymeric Laporte, getting the nod ahead of Otamendi. In central midfield, Pep decided to play the whole lot of them against Arsenal besides Foden, who doesn’t start Premier League games yet. It doesn’t seem likely that Fernandinho is going to get any rest this week, which is why it was slightly surprising that he played against Burnley in the FA Cup ahead of this tough run of games. It isn’t completely out of the question that he sits this one out, but we see the Brazilian starting. Accompanying him, we’re going for Bernardo Silva and Ilkay Gundogan, who were both good against Arsenal. De Bruyne had nothing left when subbed off against Arsenal and still isn’t quite 100%, so we see him being preserved for the Chelsea game. Likewise, David Silva has played 90 minutes in the last two games and could be rested. Riyad Mahrez has not started a Premier League game since the win over Southampton at the end of December. We could see the club-record signing getting a chance against Everton though, with Sterling dropping down to the bench before being restored against Chelsea. Leroy Sané was fully rested against Arsenal and should come in on the left. Up-front, Sergio Aguero is bagging for fun at the moment, but so was Gabriel Jesus before Pep benched him for the last two games. Again, it’s the luxury of having such a talented squad that the manager can do that, and we foresee Gabriel Jesus starting against the Toffees before Aguero returns to line up against Chelsea. That leaves the bench, which should look something like: Aro Muric, Benjamin Mendy, Nicolas Otamendi, Phil Foden, Kevin De Bruyne, Raheem Sterling and Sergio Aguero.